Republished August 1, 2018, to correct units on infographics. China, India, and Africa are three of the most populated parts of the world. Their economies collectively consume about one-third of all global energy, and their energy consumption is projected to grow faster than the rest of the world through 2040. As a result, changes in these economies have significant implications for global energy markets. Today, EIA is releasing three reports in its International Energy Outlook 2018 (IEO2018) that discuss the energy implications of potential changes in these economies. A related webcast presentation and panel discussion will begin at 9:00 a.m. Eastern Time this morning from the Center for Strategic and International Studies. 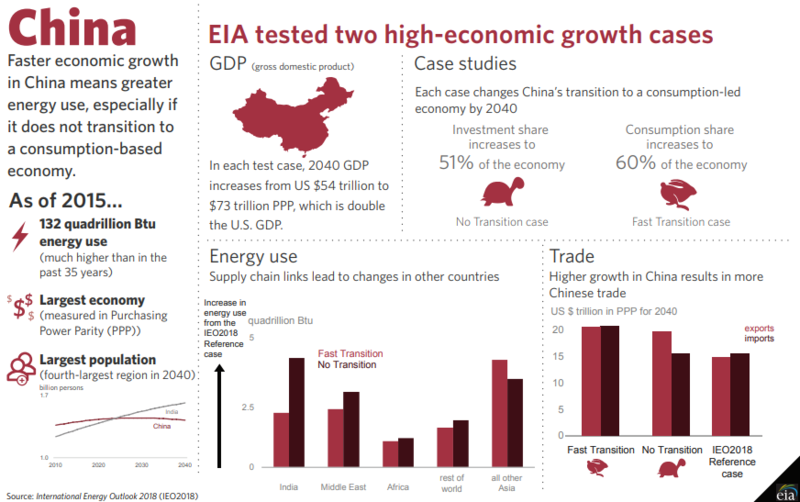 In all IEO2018 China side cases considered, China’s economy remains by far the world’s largest producer of energy-intensive goods in 2040. Faster economic growth in China leads to higher energy consumption, but the amount it increases depends on how quickly China transitions from an export, investment-led economy to a more service-oriented, personal consumption-based economy. 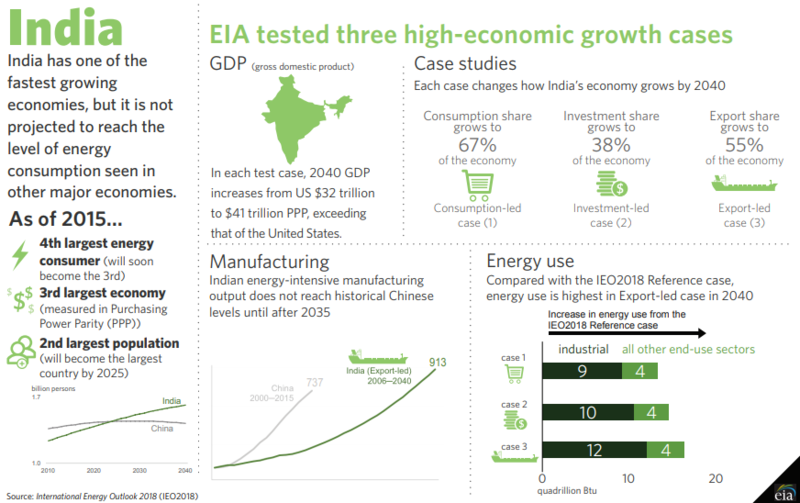 India is projected to be the most populated country with the fastest-growing economy in the world under all three India side cases; however, Indian energy consumption levels do not reach those in China or the United States in the next two decades in any of India's side cases. Higher economic growth across Africa leads to an expanding manufacturing sector and increasing industrial energy consumption because of possible regional competitive advantages. Higher assumed economic growth over the projection period leads to African energy consumption per capita that is 30% higher than in the Reference case in 2040. 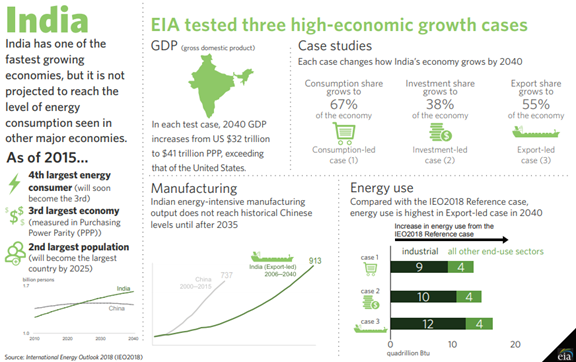 China, India, and Africa collectively accounted for 32% of global energy consumption in 2015, and in the IEO2018 Reference case, these regions are projected to account for 36% of global energy consumption in 2040. IEO2018 builds on the Reference case presented in last year’s outlook, IEO2017. The IEO2017 Reference case has been updated with macroeconomic information, but no modeling changes have been made to other end-use sectors. This year’s outlook offers a macroeconomic perspective regarding the uncertainty in economic growth in China, India, and Africa. The side cases in IEO2018 increase annual average growth in real gross domestic product (GDP) between 2015 and 2040 to higher levels than in the IEO2018 Reference case. To consider uncertainty related to economic structure, the composition of economic growth is also varied in the cases for India and China. 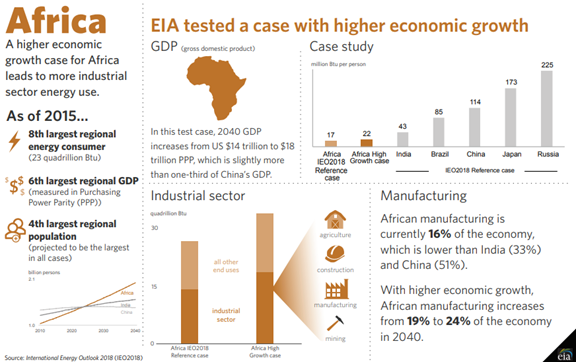 EIA also generated an economic growth case where Africa’s economy grows faster than in the IEO2018 Reference case. Today’s webcast includes a presentation from EIA Administrator Linda Capuano and a panel discussion with Todd Moss from the Center for Global Development, Anvita Arora from King Abdullah Petroleum Studies Research Center (KAPSARC), and Edward Chow from the Center for Strategic and International Studies.